South Korea’s President Moon Jae-in has said Japan should take a “more humble” attitude towards the past, warning Tokyo not to undermine bilateral ties by “politicising” the issue of South Koreans forced to work by Japanese companies during World War II. Relations between the two countries have long been strained by disputes over history and territory, with the issues largely stemming from Japan’s brutal 1910-1945 colonial rule over the Korean Peninsula. “I think the Japanese government should take a more humble attitude … but the Japanese politicians are politicising the issue,” Moon said in a press conference on Thursday. Current arguments largely centre on the so-called “comfort women” pressed into sexual slavery for Japanese troops during World War II and labourers made to work for Japanese firms, with a territorial dispute also rumbling over islands controlled by Seoul. In October, South Korea‘s top court ruled that Japanese steelmaker Nippon Steel & Sumitomo Metal Corp should compensate four former labourers. Japan subsequently claimed that a South Korean warship had locked its radar on a Japanese patrol plane. On Wednesday, Tokyo demanded diplomatic consultations with Seoul after a South Korean court approved the seizure of part of Nippon’s domestic assets, calling the move “extremely regrettable”. According to official Seoul data, as well as the comfort women, around 780,000 Koreans were conscripted into forced labour by Japan during its 35-year occupation. Japan maintains that all historical compensation issues between the two nations were settled under the 1965 treaty that re-established diplomatic relations between them. Under the treaty, a package of about $800m in grants and cheap loans was provided to the former colony in compensation. Tokyo argues the court decisions are a breach of the treaty and international law. Moon said many South Koreans felt the 1965 treaty did not solve all issues for the victims, adding such views were “not created by the government but by unfortunate history” and telling reporters: “We should respect the court ruling”. Separately, Moon told reporters that a visit by Kim Jong-un to Seoul, as well as a second summit between the North Korean leader and US President Donald Trump, were “imminent”. At their first meeting in Singapore in June last year, Kim and Trump signed a vaguely worded document with the North Korean leader pledging to work towards the “denuclearisation of the Korean peninsula”. But progress has since been stalled, with both sides arguing over their agreement’s interpretation. Pyongyang needed to take “bold, practical measures for denuclearisation” to ensure sanctions are lifted, Moon said, but added that “corresponding measures” were also needed from Washington, such as agreeing a “peace regime” and formally declaring an end to the 1950-1953 Korean War. 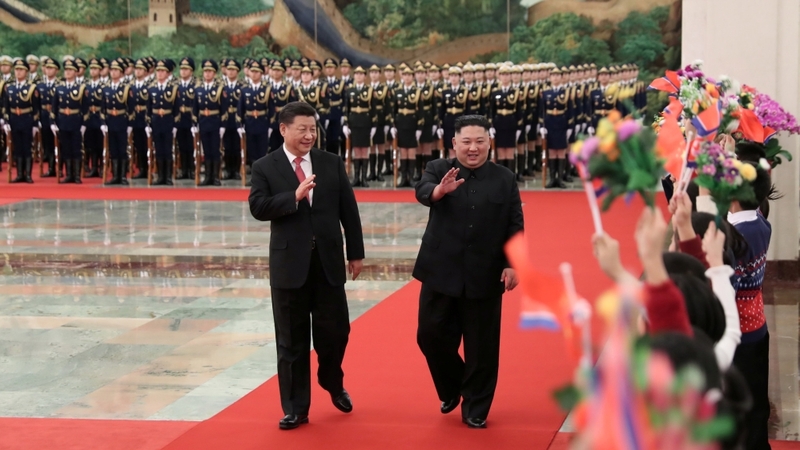 Kim on Wednesday concluded a trip to China, North Korea’s key diplomatic ally, during which Chinese President Xi Jinping expressed his support over the possible summit with Trump. “I think Chairman Kim Jong-un’s visit to China will have a very positive effect on the success of the second US-North Korea summit,” Moon said in the news conference in Seoul. Kim and Moon met three times last year and have made a series of goodwill gestures as well as vowing to resume economic cooperation when possible. The two countries have also taken steps to reduce their conventional military threat, such as removing mines and firearms from the border village of Panmunjom, destroying some front-line guard posts and creating buffer zones along their land and sea boundaries and a no-fly zone above the border. In a letter to Moon late last month, Kim “expressed a strong willingness” to visit Seoul in 2019, according to the South Korean president’s office.